BugDoc Dave here with my monthly Stretch Tuesday discussion. I really loved seeing the marigold pieces in October and now that Brian has changed the theme to “sets,” we’ll have plenty of things to show and tell! I see that many of the carnival sets are punch bowl with cups sets which are actually relatively rare in stretch glass. Only a few of the stretch-making companies made pitcher and tumbler sets, and they didn’t make many forms (Fenton made the largest array). 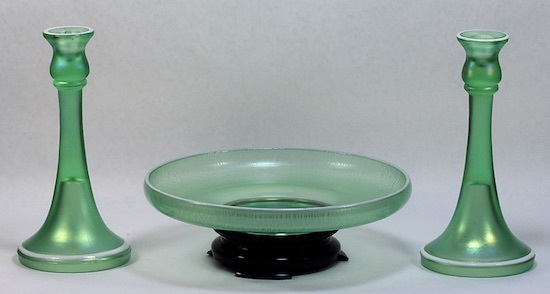 In stretch glass, the most common “set” was the console set which consists of a pair of candleholders and bowl, usually on a black base. Nut sets, creamer and sugar sets, bath items (mainly jars and colognes) and a smoking set by Fenton are other items found in sets. Tonight, I’ll concentrate on the console sets. Since I don’t want to take up a lot of space, I’ll run another grouping of console sets at the end of the month. The candleholders plus bowl console sets were prominently illustrated in catalog pages and glass industry advertisements, so we know that they were designed for this purpose. My first two sets were made by Central Glass. 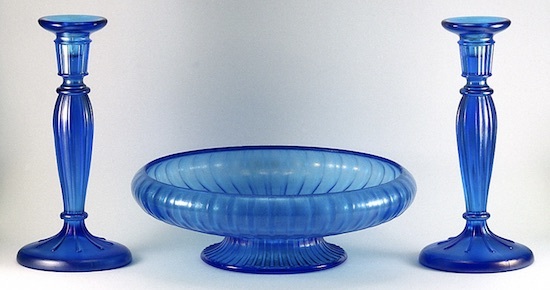 Central primarily used one bowl mold but gave it many different shapes, plus a 6 1/2-inch candleholder and an 8-inch candleholder, both trumpet shaped. The first example is in green. 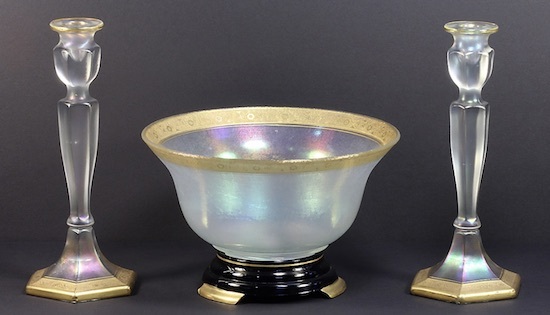 The rolled rim bowl with a glue-chip decoration is accented with gold enamel, as are the candleholders. The next set is in the tough-to-find cobalt blue color. 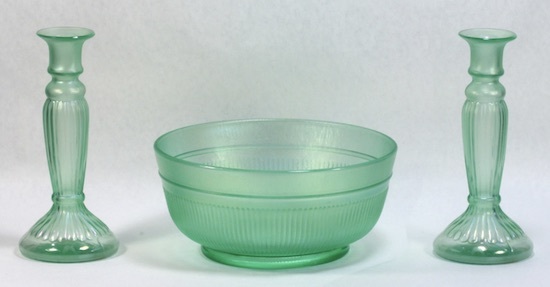 In this case the bowl is the low form. Diamond console sets were not often figured in the trade ads so we often put together sets that look “correct!” Here is an example of their 10-inch flared bowl and the trumpet-shaped candleholders (often called Mae West) in Blue Crackle stretch! Diamond also made a trumpet-shaped candleholder that looks a lot like the Central 8-inch one. Here they are paired with a bowl in green. Notice that both the bowl and candleholders have white enamel trim. The Diamond #900 line (what collectors call Adam’s Rib) pieces can also be assembled into a console set. In this set, I’ve used the blown-molded candleholder/vases plus a wide bowl in green. Without a doubt, Fenton made the widest array of candleholders and bowls which can be assembled in various way to form console sets. One of my favorites is the #232 (candleholders) with the #231 footed bowl. This set is in Celeste Blue. Here is a smaller set and the matching decoration indicates that they are an original set. The candleholders are the #316 (with two-ring stems) and the bowl is the #607 low bowl. All are in Persian Pearl with blue enamel rings. Here is a Tangerine console set using a #917 rolled rim comport and the #316 (one-ring stems) candleholders. Here is a Persian Pearl set that is using the #647 bowl and 10-inch #346 candleholders. This set was acid etched and painted by a secondary decorating company so we know it is a matching set. Finally, here is a twin dolphin (#1504A) set in Florentine Green. More in a couple of weeks! !